I was recently contacted by a representative for eShakti, a custom clothing manufacturer, who offered to send me a garment of my choosing in exchange for my honest review of their product. I happily accepted, of course, eager to see what their company can do. Their mission is simple: budget-friendly clothing customized for your size and taste. Perusing all their beautiful dresses, I had a hard time whittling down my options, but I eventually chose the Birdsong dress in a bright, cheery orange with navy, white, and cornflower blue embroidery on the skirt. I provided my measurements for a custom fit, but they also have a wide selection of standard sizes available (0-36) if you'd like. In addition to sizing, you can choose your neckline (I kept it as shown), sleeve length (kept it sleeveless), and skirt length (above the knee). You can also forgo the embroidery if you'd prefer a simpler style, or you can remove the side seam pockets (but why would you want to do that?). There may be even more options, depending on which garment you choose. It took about a week for the creation of the dress and only 3 days to ship it halfway around the world. When this lovely gem arrived in the mail this week, I ripped open the package like a kid on Christmas! 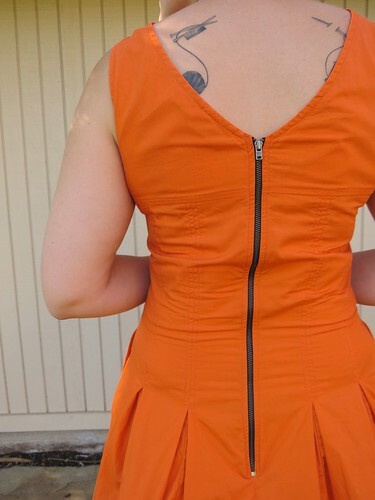 The back has a cool exposed black zipper, and there are little bra strap holders in the shoulders. The craftsmanship - the embroidery, top-stitching, everything - is fantastic! For work today, I paired with a navy cardigan, a wide white belt, and my silver wedge sandals. Edited to add: GET 10% OFF your eShakti order until July 3, 2014 with the coupon code "KNITES"
Code has to be entered in the ‘promotional code’ box. It is not case-sensitive. This discount code is not applicable on clearance/sale, gift cards and overstock categories. Not applicable on previous purchases. Certainly, not for everyday, no. I'm far too spoiled by my super cheap thrifted refashions. But if I had a special occasion and needed a nice dress, I'd definitely visit their site again. Wow, great experience on their site. Thanks for sharing. Almost like having a private designer. I can see this very beneficial to someone hard to fit, or with partly petite proportions, or who needs that one perfect, timeless, go-to dress or outfit. Would make a great gift. Just sayin'. Absolutely, Lisa! Glad you like them.